They are very tart tasting, because they are more acidic than ripe tomatoes. Tomatoes increase in sweetness and drop in acidity as they ripen more. 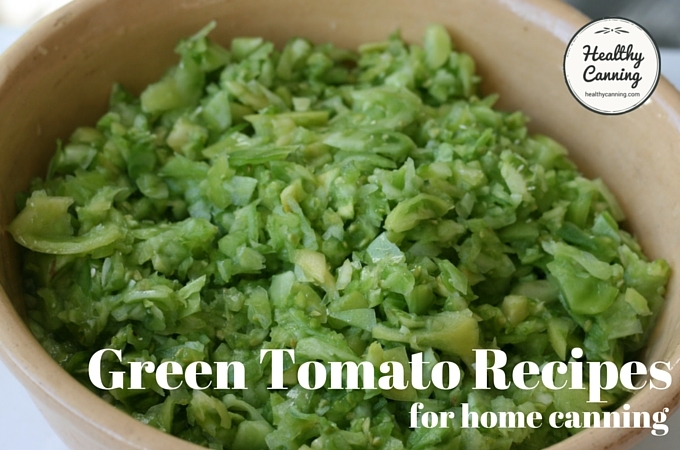 If you want to just get right to the recipes, here’s the link for recipes that call for green tomatoes. 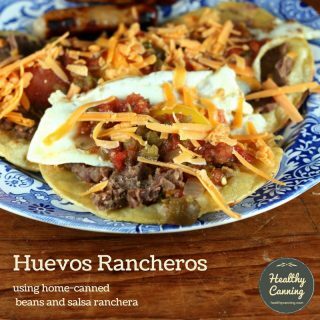 These tested recipes are from various sources such as the USDA, Ball, Bernardin, etc. 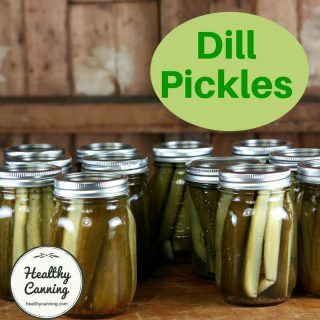 Do not ripen green tomatoes indoors for canning, the proper acidity may not develop. Instead, harvest green tomatoes from late season or frost-damaged vines and use these green tomatoes in a relish or salsa.” Ingham, Barbara. Take Steps to Ensure a Healthy Harvest. University of Wisconsin-Madison. Page 1. 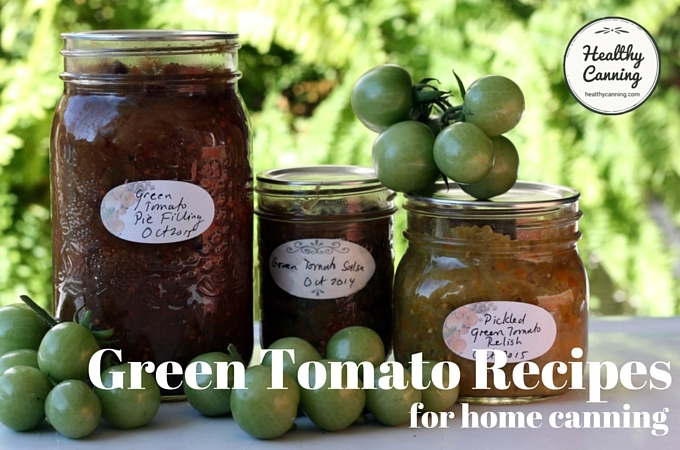 So rather than trying to ripen green tomatoes indoors off the vine to some shade of pink or red, and then treating them as “regular tomatoes”, you should use them as green tomatoes in a condiment recipe, where tons of acidity is added naturally anyway for the recipe. 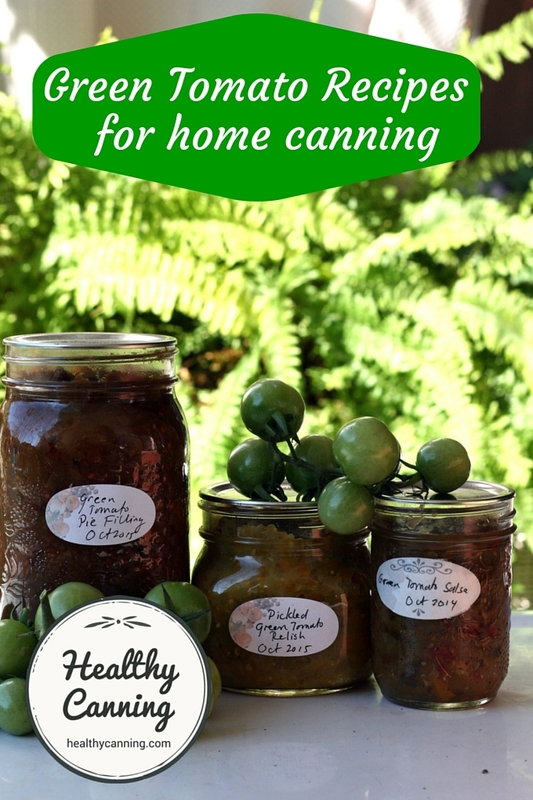 Some home canning recipes for green tomatoes may rely on them for their firm, “dry” texture. They aren’t very juicy or watery. Rather than going into a “mush” as ripe tomatoes will when chopped, green tomatoes chop up instead into a fine, firm dice, like cucumbers. This makes them useful for things such as Green Tomato Relish. Others recipes may rely on them for their high acidity to make that recipe safe — recipes such as Kosher Dilled Tomatoes, which uses a weak brine, certainly relies on the green tomatoes having their own natural high acidity to keep the recipe safe. So when a recipe calls for green tomatoes, use them and not ripe tomatoes. The only safe substitution that may be made for green tomatoes is swapping in tomatillos, as they also are very acidic, if not moreso. The USDA’s table of “Approximate pH of Foods and Food Products” assigns a pH value of 3.83 to tomatillos. USDA. Center for Food Safety and Applied Nutrition. 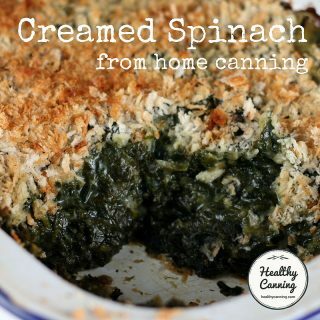 Acidified and Low-Acid Canned Foods. April 2007. Accessed March 2015. Green tomatoes for pickling whole as a pickled thing in their own right, as opposed to an ingredient in relish or chutney, should be about a max of 3 cm (1 inch) wide. Larger ones are usually chopped up for use in a mixture. The authors of the Ball / Bernardin Complete Book are uneasy about the solanine in green tomatoes. 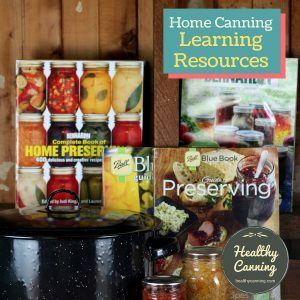 While green (unripe) tomatoes can be safely used as an ingredient in many home canning recipes, we don’t recommend preserving them as a stand-alone item. Green tomatoes contain a compound called solanine, which can be toxic if consumed in large amounts. Moreover, solanine — like other alkaloids, such as caffeine — contributes an astringent taste to foods that must be balanced by sweeter fruits, vegetables or sugar. The darker the green, the higher the tomato’s solanine content. The safest strategy is to use only pale green tomatoes or those tinged with red. 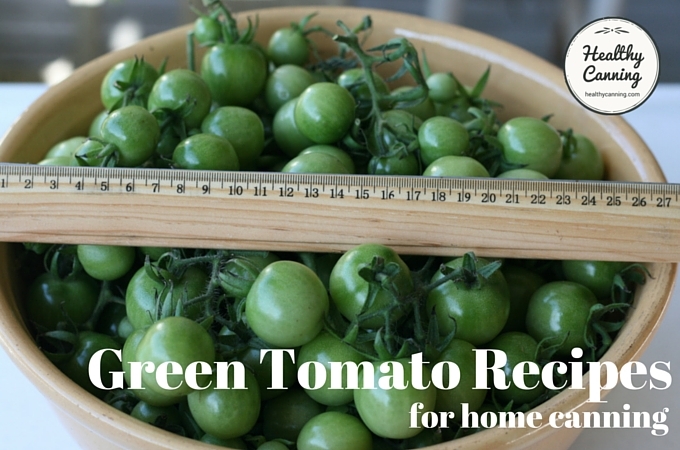 If you have a supply of green tomatoes, you can ripen them considerably by placing them in a brown paper bag or between layers of newspaper until the intense green pales.”  Kingry, Judi and Lauren Devine. Bernardin Complete Book of Home Preserving. Toronto, Canada: Robert Rose Inc. 2015. Page 352. Note that this is not a concern that has been officially expressed by the USDA or officially by any member of the Cooperative Extension System. Many people get green tomatoes simply by growing tomatoes, and harvesting them early, or waiting till the end of the growing season and seeing what isn’t going to ripen in time before the onset of winter. Many urban canners grow tomatoes in containers on a balcony, porch, etc, expressly to get some green tomatoes at the end of the season. You’ll rarely, and perhaps never, see them sold in stores. Some people say they’ve had luck asking their green grocer, or produce department manager at their local supermarket to order some in for them. Note: this topic does not refer to the heirloom tomato varieties that stay green when they are ripe, such as German Green, Emerald Giant, Green Giant and Green Zebra. 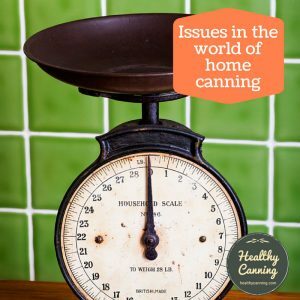 They are ripe, and so won’t have the same low pH / high acidity that home canning recipes are often counting on in actual unripe green tomatoes. 2. ↑ Ingham, Barbara. Take Steps to Ensure a Healthy Harvest. University of Wisconsin-Madison. Page 1. 3. ↑ USDA. Center for Food Safety and Applied Nutrition. 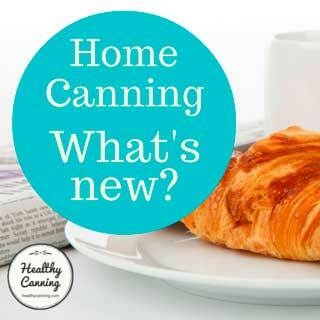 Acidified and Low-Acid Canned Foods. April 2007. Accessed March 2015. 5. ↑ Kingry, Judi and Lauren Devine. 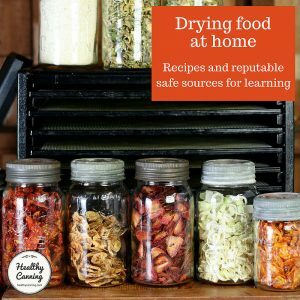 Bernardin Complete Book of Home Preserving. Toronto, Canada: Robert Rose Inc. 2015. Page 352. I want to can some green tomatoes this year. I want to can them so that I can fry them when I am craving fried green tomatoes in the middle of the winter! A good friend of my grandmother use to can them this way, and I loved them! But she passed away before I could obtain her recipe! Any ideas? Craving them now! I have not heard of any per se from any reputable sources for plain tomato (unless you are talking perhaps about pickled slices.) There is one though that I wonder about : ( Whole or Halved Tomatoes (packed raw without added liquid) https://nchfp.uga.edu/how/can_03/tomato_without_liquid.html . Write to the NCHFP ( https://nchfp.uga.edu/contact_more_info.html ) and ask them if that would give you slices firm enough to fry up (I suspect not) or if they can think of any other tested options. If you are on Facebook, you could also try asking Ball or Bernardin via their Facebook pages. Cheers. 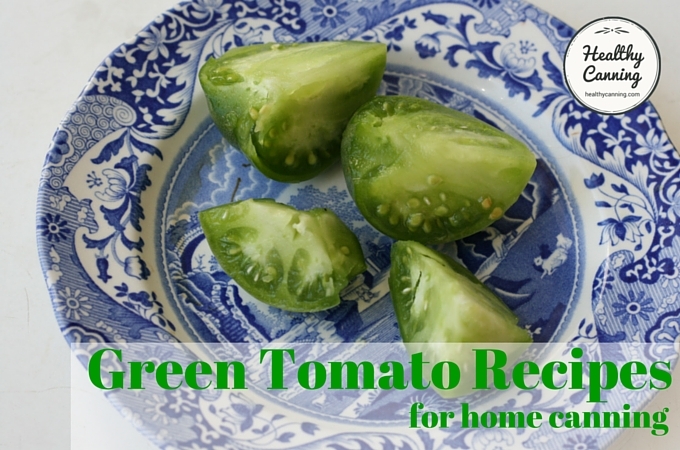 There is a recipe that I have for canning slices of green tomatoes that you can fry in the winter. I use pint wide mouth jars for these so make sure your tomato slices will fit. I wash the green tomato, cut the stem out and slice the tomato in 1/4 inch slices. 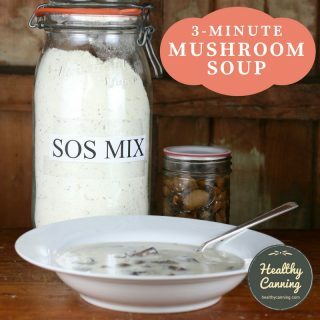 Fill the jars with the slices, add 2 tsp. 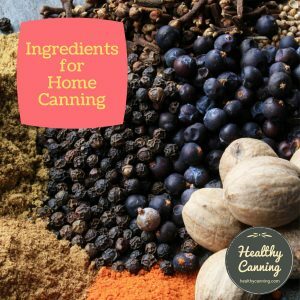 of canning salt, 1 tbsp. lemon juice, and then fill the jar with room temperature water and leave at least a 1/4 inch of head space. 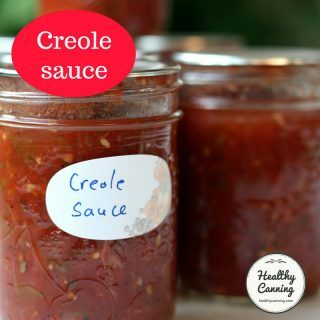 Use a knife and run around the inside of the jar, between jar and slices, to remove any air bubbles. Wipe the rims of the jars well until it is dry. Place the lids on the jar, put the ring on and lightly twist to tighten. Don’t make them too tight, just turn until you feel resistance. 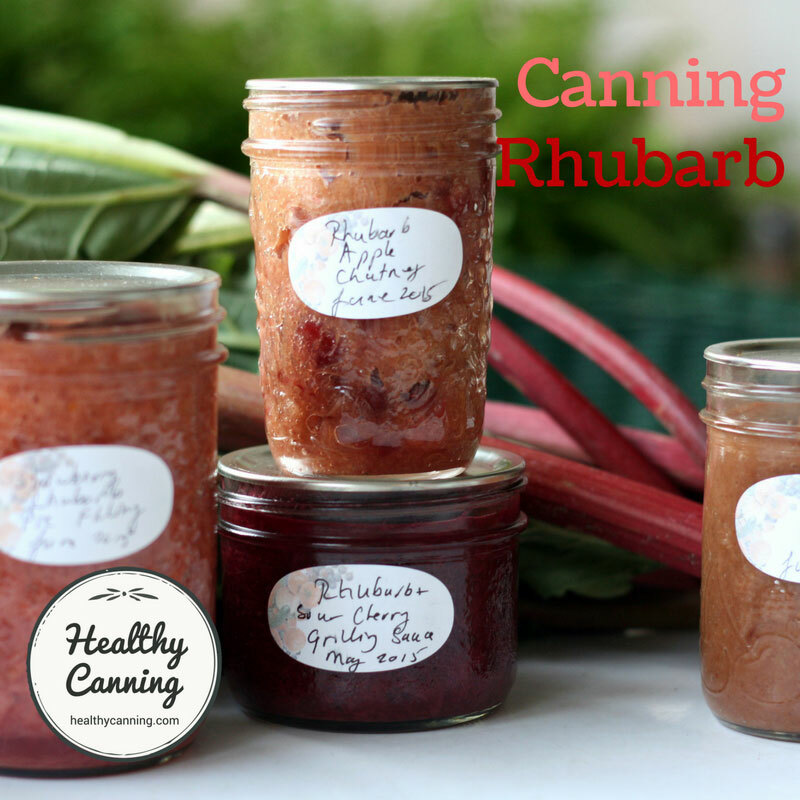 Place the jars into a warm water canning bath with water covering the jars by 1inch. 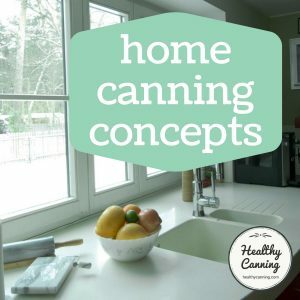 Bring canning bath to boil and turn down to slow boil. Process for 40 minutes! Remove jars and place on counter to cool, at which time the jars will seal as they cool. 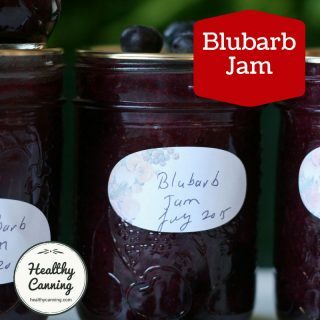 Leave ample space around the cooling jars for air to circulate. Don’t move the jars, just leave them there for a few hours or so. 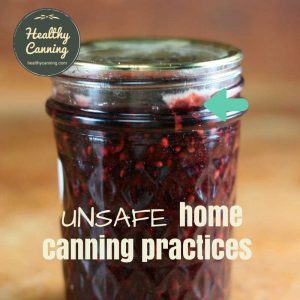 If they do not seal, you can repeat the process with a new clean lid and process again or just put in fridge to use within a few days or so. They should seal if the rims are clean and you have processed correctly. FYI…make sure you sterilize your jars before you fill them and don’t forget to boil the lids until you are ready to use them. Good luck and happy winter eating! Hi Cheryl, that is interesting, do the slices come out firmly enough for frying? Also just want to confirm that Cheryl’s directions do conform with USDA directions for canning whole or halved tomatoes (https://nchfp.uga.edu/how/can_03/tomato_water_pack.html ), though they might not like the pack type of slices re heat flow inside the jar. You could email the NCHFP to ask.